The "zombie apocalypse," once on the fringes of horror, has become one of the most buzzworthy genres in popular culture. Now, in Plague of the Dead, Z.A. Recht delivers an intelligent, gripping thriller that will leave both new and die-hard zombie fans breathless. The end begins with a viral outbreak unlike anything mankind has ever encountered before. The infected are subject to delirium, fever, a dramatic increase in violent behavior, and a one-hundred percent mortality rate. But it doesn't end there. The victims return from death to walk the earth. 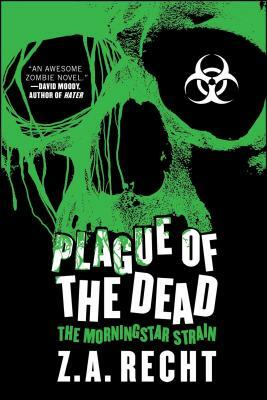 When a massive military operation fails to contain the living dead it escalates into a global pandemic. In one fell swoop, the necessities of life become much more basic. Gone are petty everyday concerns. Gone are the amenities of civilized life. Yet a single law of nature remains: Live, or die. Kill, or be killed. On one side of the world, a battle-hardened general surveys the remnants of his command: a young medic, a veteran photographer, a brash Private, and dozens of refugees, all are his responsibility---all thousands of miles from home. Back in the United States, an Army colonel discovers the darker side of Morningstar virus and begins to collaborate with a well-known journalist to leak the information to the public...and the Morningstar Saga has begun.